Of all the space heater types that you can purchase, electric fireplaces are possibly the category which has the greatest choice in terms of style. From small log effect heaters, through those with a traditional looking mantle, all the way up to those with multi-colored LED light effects, there should be an electric fireplace design to please everyone. In this article, we are going to review several of the best electric fireplaces, and our buyer's guide will provide you with further information and advice to help you make the best possible choice. For an electric fireplace which provides a good level of heat at the same time as adding some traditional style to your home, this heater from Duraflame hits the mark. It can produce up to 5,200 BTUs from its infrared quartz heating system, and you have complete control over this, using either the remote controller or the push-button controls on the heater, which has an LED display to help you set the temperature. The log effect and 3D flames are very realistic and add a very warm visual aspect to the heater, even when the heat is not on. 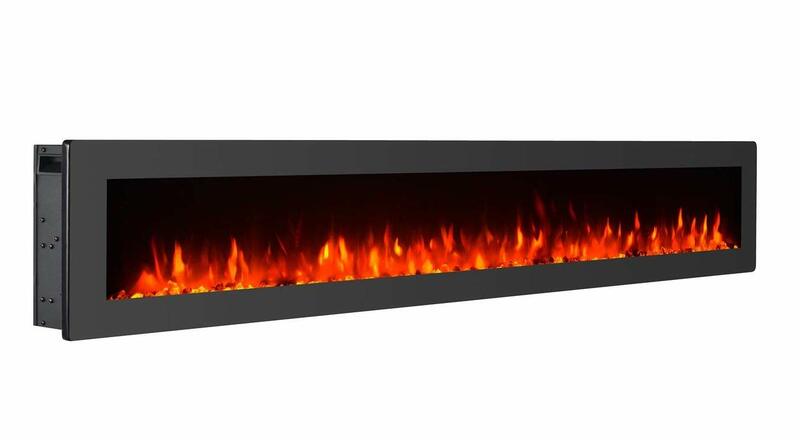 The black surround adds to the design and helps the contrast with the log and flame effects, especially as they can be viewed from three sides through the glass panels. With a weight of just 28 lbs. and the longest side being only 24 inches, this freestanding electric fireplace can be moved easily, and positioned wherever you wish in living rooms, and dining rooms. This electric fireplace requires some installation as it needs to be inserted into a recess within a wall, or a real or false chimney breast and then powered from a 120v power socket. Once it has been fitted the fire protrudes by barely 1-inch, so it is great if floor space is at a premium and you have nowhere to place a freestanding heater. The heater can be controlled from the hidden panel on the front of the heater where you can select the heat setting, adjust the thermostat and select the flame settings. You can also select the heat settings and flame effects using the remote control, but it doesn't have a thermostat control. With resin logs to create the effect of a real fire, the variable brightness and intensity of the LED flame effects provide an excellent display, which can be left on, even if the heat has been turned off. If you like the idea of having a wooden surround already assembled for you, then this one from Ameriwood Home should appeal to you. It comes with an MDF/particle board surround with a cherry woodgrain finish and grooved edges which should enhance most lounges and dining rooms. All you need to do to start using it, is decide where you want to position the heater and plug it into the nearest power socket. There are both wood log and LED flame effects, which add to the pleasing appearance of this electric fireplace, and you can have these effects on without the heater running. The heater unit is a convection heater which will blow warm air into the room, but unfortunately, there is no way to adjust the heat output. This is a respectable 4,600 BTUs, which should be enough to heat most small to medium-sized rooms. Mantle for vases, photo frames etc. The design of this electric fireplace manages to combine modern styling, with a traditional surround and mantle. The result is a heater which will stand-out in any room it is placed in. We say 'placed', because there is no installation required and in fact, this electric fireplace is fully assembled and ready to use as soon as you receive it. Simply plug it in and switch it on. When you just have the power on, the LED flame effects will come on which can add a nice, cozy atmosphere to whatever room it is. When you want to add some heat too, you press the 'Heater ON', switch and the convection heater will start warming the room. Beyond these two buttons, there are no other controls so neither the flame effect or heat level can be adjusted. If you are looking for the electric fireplace which is the easiest to operate, then this one from Duraflame is as simple as they come. 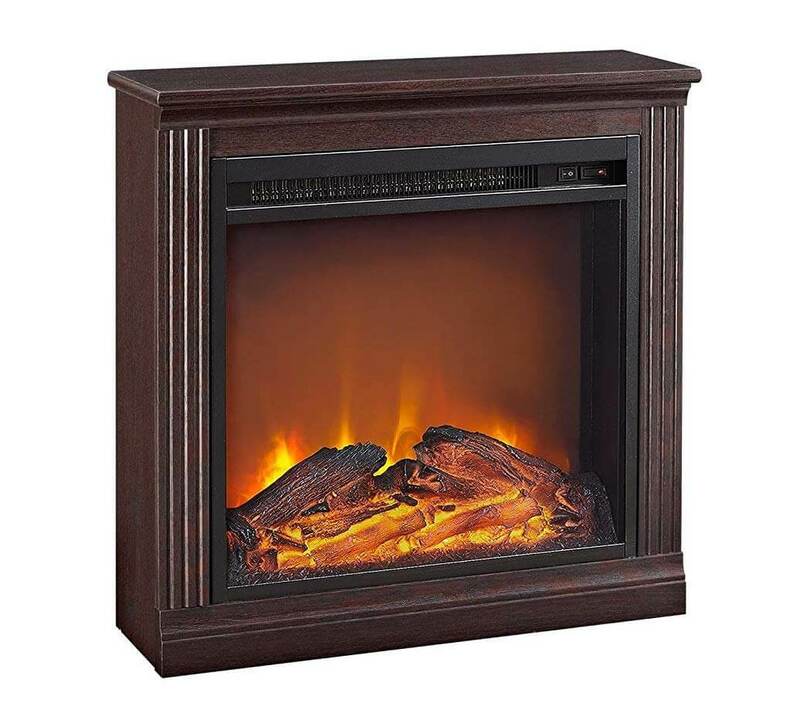 If you already have an existing recess a or chimney breast and are looking for a small electric fireplace to fill it, then you should seriously consider this log effect heater from Duraflame. It certainly takes the prize for the lightest and smallest heater we are reviewing in this category, therefore, it should fit in small spaces which many heaters would be too big for. There are controls on the side of the heater which allow you to adjust the heat levels via a thermostat and you can also adjust the brightness of the flame effects from this control panel too. For the ultimate in convenience there is also a remote control which means you can make all these adjustments from the comfort of your armchair. 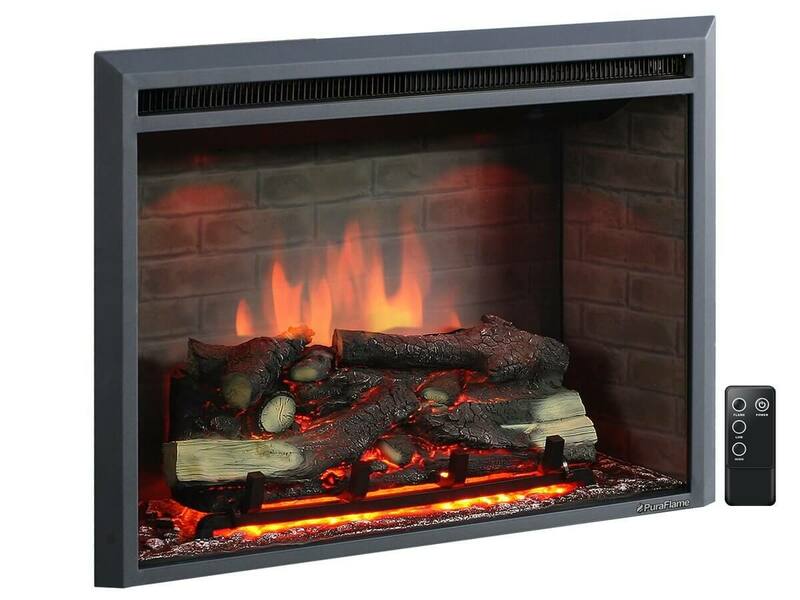 The convection heater within this electric fireplace produces up to 4,600 BTUs. If you don't need any heat but wish to have the flame effect running to help the ambiance in the room, you can do so. For rooms which are a bit more ornate, you need an electric fireplace which fits with that and the styling and detail of the surround which comes with this one from SEI, should enhance any such room. It has a very decorative carving just above the heater, and the grooved sides complement this excellently. The surround will need to be assembled as it comes flat-packed, but it is relatively simple to do, and there are clear instructions provided. Thankfully, there is no need to hardwire it, as it can be plugged into a normal domestic power socket. Convection heat is produced up to a level of around 5,100 BTUs which should help to heat most small to medium-sized rooms. The heat can be controlled using the adjustable thermostat control which is on the digital control panel on the front of the heater. The first thing you will notice about this electric fireplace it how long and thin it is. it is 5 feet long, but only 1 foot in height, so it is not the typical size or shape for a heater. Whilst the size may limit where you place the heater, you actually have two options of how you do so. It can be mounted onto a wall or a chimney stack, or it can simply be placed on the floor and used as a freestanding heater. While nearly all electric fireplaces have flames effects, few can be as colorful as this one. You have no fewer than 9 different color options, and 5 brightness levels for the flame effect which looks stunning when the flames are dancing behind realistic-looking crystal stones. As well as adjusting the flame colors, you can also adjust the heat. Whether it is colors or heat, all the adjustments can be made without having to get up, thanks to the remote control which comes with this electric fireplace. This is an electric fireplace that many people will buy for its stunning visuals, as much as for its ability to heat a room. Once it has been fitted into a suitable recess, its black front panel gives the heater a look that is as modern as can be. The great look doesn't end there because at the heart of this electric fireplace, is a flame effect that is almost mesmerizing. In front are glass crystal-like stones and log effect, and once the flame effect is on, you can set it to operate in several ways. First, you can select blue, orange or blue and orange for three different color effects, then you can choose how intensely the flame and ember effect 'burns'. You can set it so it is just glowing, or at the other end of the scale have it act like a roaring fire. The heat produced is up to 5,100 BTUs although you can set it to low if you prefer. The remote control can be used for this and to adjust the flame effects. One of the best aspects of electric fireplaces is that there is such a huge diversity in the types, styles, and designs of these heaters. The beauty of this is that there should be one or more products to suit, not just an individual buyer's preferences in terms of styling, but also accommodate different room sizes and types. There are three main categories that electric fireplaces fall into, and within each of these, there can be sub-categories. There will also be variations in sizes, and this can occur for individual products. Where sizes differ, is it not so much the type of heater that is you would compare but whether the size of the electric fireplace you choose is appropriate for the room or wall size. There is more diversity within this category than the other two categories, given the number of different designs that can be created for a freestanding electric fireplace. It is also the category where there more products to choose from. Stove - These are usually small, lightweight and portable heaters that mimic the styling of real stove heaters that burn wood, but with these, you do not have any of the hassles of venting them. These simply get plugged into the power socket and they are on, with you soon enjoying the visual effects of a real fire provided by realistic burning log and LED flame effects. Mantle Surround (Pre-Assembled) - These are electric fireplaces which consist of the heater unit, and a surround with a mantle. Normally the only installation you need to do is position it in the room where you plan to use it and plug it into a power socket. One obvious advantage of having a mantle is that it can be used to display ornaments or photo frames. The designs for these mantle surrounds can vary greatly, both in terms of their color, and the level of decor. Some are plain, while others have very ornate 'carvings' on them. Colors can include black, white, and some have a very attractive woodgrain finish, with wood colors such as cherry, pine and redwood to name but three. Mantle Surround (Requires Assembly) - These can have all the features we have just discussed in terms of styles and designs, with the major difference being that they need to be assembled first. In other words, the surrounds come flat-packed and just as with flat-pack furniture they need to be assembled. There is no real price advantage associated with this type versus pre-assembled, so it is just a case of different manufacturers choosing to produce their products in different ways. If you see one of these which is the one you really like, don't let the fact it needs to be assembled put you off. Assembly is generally quite straightforward, and most manufacturers provide easy to follow instructions. These electric fireplaces require a recess in the wall of the room you are placing them in. The reason for this is that once it is installed the front of the heater will sit almost flush, or at most have an inch or two protruding. Obviously, if you already have a recess that was created for a previous fireplace then that can be used, with the caveat that the new electric fireplace needs to be the right size to fit it. Otherwise, you will need to create a new recess yourself or pay a contractor who can do this work for you. There are various ways this can be done, and much will depend on whether the wall is brick or plasterboard. Another option could be to create the recess in an existing brick chimney breast. If you do not want to go to the trouble of creating a recess for an electric fireplace, then you'll want to consider the products in this category as they get as close to how the insert ones look. The obvious difference is that where the insert ones are almost flush, these will protrude more as they sit flat against the wall rather than sitting in a recess. Having said that, it is not as if they are going to stick out halfway across the room. Many of these electric fireplaces are less than 5 inches deep, so can still look very thin, even when mounted on a wall. The main thing you need to ensure with these is that they are secured to the wall with the proper mounts that are supplied with them. They can weigh 50 lbs. and upwards, and if the mounting job is botched the risk of the heater falling off the wall and giving someone a serious injury, especially children, is high. Obviously, there are all sorts of products which you can buy that will help you to heat the rooms in your home. Each will have their positive features and advantages of using them. As this article is primarily discussing electric fireplaces, we need to highlight the main advantages that they have. Some might argue that having too much choice can be confusing, but it is only confusing if you do not take the time to find out more about the products...which is exactly what you are doing by reading this. Electric fireplaces come in all shapes, sizes, styles, types and designs, which gives everyone considering them a huge selection to choose from. Whether they need a small portable one like a freestanding stove heater or want one with very decorative mantle surround, or if they want to go all out and build a new stone fireplace with recesses so that they can insert their heater, and a TV, there is a fireplace for them. Very few other space heater types offer this amount of diversity, with some looking all very much the same, such as oil-filled radiators. That's not to say that oil-filled radiators are not good heaters, in fact, they are excellent, but because of how they are designed there's not many significant differences between them in terms of appearances. Regardless of which type of electric heater you choose, you can almost guarantee that it will be something special to look at. Those wonderful design features will include the decorative designs on mantle surrounds, the glass panels and copper handles on some stove heaters, the wood grain coloring on some surrounds, and most of all, the log and flame effects that almost every electric fireplace has. These effects, with their warm glowing colors can help you feel warmer when they are switched on, even if the heat hasn't been. Even if the heat is on, the beauty of some of these displays is stunning. Some have the option to alter the brightness of the flames, and you may also be able to adjust the perceived intensity of them from ‘glowing’, to 'ablaze'. Best of all there are the color options which on some electric fireplaces allow you create a kaleidoscope of color with everything from red, blue, purple, green and many other colored flames dancing in your fireplace. Compare all this style, design and color with electric baseboard heaters, which are basically rectangular boxes. You can get covers for them which add a little bit of style, but there's no comparison with electric fireplaces in terms of design. Despite all the options for flame effects, nearly all electric fireplaces are very easy to use. Most have simple control for adjusting the heat settings and adjusting the temperature via a thermostat. Many even have digital controls or a digital display so you can see exactly what setting you have chosen. Best of all, there are some electric fireplaces which come with a remote control, so rather than having to get up to adjust anything, you can simply sit where you are and do it from there. Even though some freestanding electric fireplaces need their surround assembled, and the insert ones need a recess, in terms of making them operational, most simply need plugged into a power socket and switched on. There's no need to call in an electrician to hardwire them, which is a saving straight away on installation costs. That is something you can’t say about some hydronic baseboard heaters which need to be connected to your home mains supply. Electric fireplaces are one of the safest heaters that you can buy. Most of them are in a fixed position against a wall so the risk of someone tripping over them or knocking them over is virtually nil. This is one disadvantage of infrared space heaters which tend to sit in the middle of the room, and although they have tip-over safety cutoffs, it doesn't stop someone bumping into them in the first place. The other obvious advantage of them being electric is that you do not need gas, whether that is your natural gas supply or propane gas, which you need for propane garage heaters. As we have already mentioned electric fireplaces are one of the safest domestic heaters available, but as with every electrical product, there are some safety considerations that you need to be aware of. Keep the Vents Clear: Most electric fireplaces have vents which are used to take in air and release hot air. You should check these regularly to ensure they have not become blocked with pet fur, hair, dust or fluff. It is good practice when you are vacuuming your carpets to quickly vacuum the vents to keep them clear. Never Use an Extension Lead: If the power cord already fitted to your fireplace isn't long enough to reach a power socket don't connect it using an extension cord. This can overload and has the potential to start a fire. If the fireplace is portable move it closer to the socket or get a qualified electrician to install a socket which is closer to the fireplace. Never Have an Electrical Fireplace Installed near Water: Obviously, it is unlikely you have running water in a lounge or family room, but there some who take their freestanding stove fireplaces into the kitchen, and the danger of water splashing onto it and getting into the electrics is very real. Another risk associated with water is flower vases and drinking cups or glasses being placed on the mantle. This poses the risk of them being spilt and the liquid getting inside the fireplace. Keep Children Away from The Fireplace: Children are fascinated with colors and lights, so the fact that fireplaces have 3D log and flame effects which can dance around with different colors, is bound to draw their attention to them. This is fine if all they do is look from a safe distance, but they should not be allowed to get too close for fear that they try to touch the lights and get burned when they touch any part of the heater unit which is hot. Unplug the Fireplace When Not in Use: This applies to most electrical appliances and just as with all the others, is always safer if you unplug your fireplace when not use, especially at night when you retire to bed. The other major reason for this takes us back to the safety of children who might switch the fireplace on if it is left plugged in. The first thing to say about the heat that an electric fireplace provides is that it is not normally designed to be the main source of heat for your home or even the room it is in if that room is medium to large sized. In other words, it is meant to be supplementary heat, assuming that the main heat source for your home is a central heating system. Almost all electric fireplaces will produce heat in one of two ways; convection heat or infrared heat. Here is an explanation of them both. Convection heat works on the principle of heating the air in the space that any heater is situated in. Heating elements warm up the air around them and then fans are normally employed to blow that hot air out of the heater through vents and into the room. One of the advantages of convection heating is that the heat is distributed evenly across the room. As hot air rises it reaches the ceiling and then spreads as it falls down again. Another advantage of convection heaters relates to a point of safety, given that the heating elements of a heater using convection are very rarely visible, and therefore not presenting any risks of burns. Infrared heat works on the same basic physics principles that we get heat from the sun. The heat source produces heat and electromagnetic radiation transmits that heat to anything which is in the direct line of that heat. This is why infrared heaters are often called 'radiant heaters'. The advantages of heaters using this infrared radiant heat are that the heat is produced almost instantly, and the cost of running an infrared heater is normally less than those which use convection heating. Outlined below are seven of the most popular features that potential buyers look for when purchasing an electric fireplace. This not to say that every electric fireplace has all of these features, nor that if an electric fireplace you are considering, doesn’t have one or more of these features, you should pass on it. The point is these features are desirable, so the more any electric fireplace has of them the better. Here are those seven features in no particular order of importance. Most electric fireplaces will have one or more ways in which you can set and adjust the amount of heat which it is producing. The most basic is the heat settings which are pre-set and can be selected by pressing a button or flicking a switch. The most common ratings for these are 750 watts and 1,500 watts, although you can also find electric heaters which have 600 watts or 900 watts settings. In addition to these settings, many electric fireplaces also have adjustable thermostats. These allow you to get the temperature level to the most comfortable level for you. Normally you will find thermostat controls in the form of round knobs although there are some electrical heaters which have digital control panels. One final feature in relation to adjusting the thermostat is some electric fireplaces have a digital LED display which shows you the temperature level you have selected. Electrical fireplaces are very safe, but as with all heating appliances the risk of them overheating is always present. Should any heater overheat the biggest danger is that it starts to melt components which may produce toxic fumes and can also start a fire. This will only be found in freestanding electric fireplaces such as stove heaters. Due to their relatively small size, their lightweight and the fact that they are low down, there is a chance that someone will bump in to or trip over the fireplace and cause it to topple over. If this were to happen there are risks of the heater overheating, or it falls against something which the heat can melt or even set on fire. This is a feature that allows users to set a timer for when they want the heater to switch off. This is sometimes used at night where you want the heat to continue for a short while after you go to bed. The timer settings are normally in hours. One of the most recognizable features of an electric fireplace is its log and flame effects. This is designed to mimic a real log fire and flames. Most fireplaces will let you have these effects running even if you do not have the fireplace heater switched on. This can help give you a sense of 'heat' in the room, simply by seeing the flame effects. The most basic effects will simply be LED lights which flash behind the replica logs in order to recreate the imagery of real flames. More advanced electric fireplaces will have color choices, effect type options, and speed options. With any heater, there is always the risk that some of its external parts will become very hot, to the point that they could cause a burn to any person touching them. One of the more common places which heat up is the glass panels which many fireplaces have. To reduce the risk of burns many manufacturers use materials in the construction of their electric fireplaces which do not transfer heat. The result is that these fireplaces are 'cool to the touch', and this includes the glass panels we mentioned. Lots of electric heaters come with remote control units which give you the luxury of being able to control your electric fireplace while remaining seated or even lying down on your settee. These remote controls can be used to turn the heater on or off, adjust the temperature levels, choose heat settings, and some even enable you to adjust the flame effects. Having reviewed many different types, shapes and sizes of electric fireplace, it is now time for us to select which one we believe is the top one. This was not an easy task as all of them have their merits, but out in front as the best electric fireplace, is the GM Home Wall Mounted Electric Fireplace. The option to wall mount this fireplace or have it freestanding on a level surface is a huge plus for us as it gives buyers a choice of where they can place it. A remote control is also a big positive, but undoubtedly its top feature is the awesome multi-colored flame effect. This is almost like having our own little light show in your living room, and you can sit, watch and enjoy it while getting warm at the same time.